A 21st century square no longer exists for a singular purpose. Everyone has its own reason to come to a square. Each reason creates its own place. Everyone becomes each other’s background. Sometimes they will share a space to create a larger voice. A square is a place where monumentality coexists with everyday life, and this allows a square to transform into many things, to a park, a passage, or back into a square. 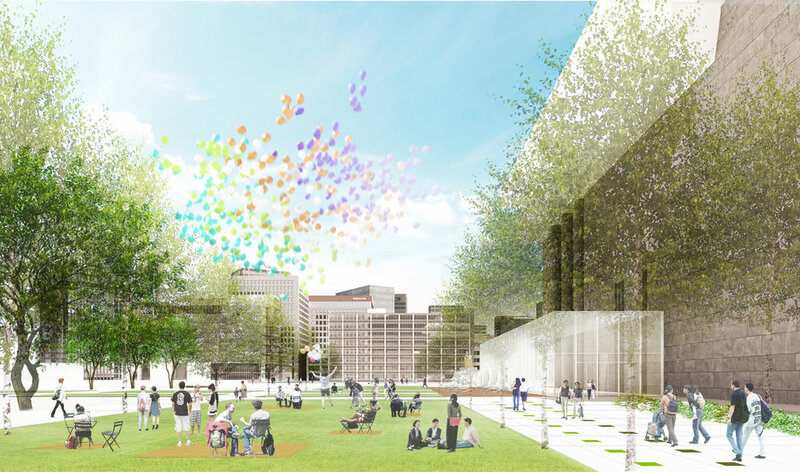 We expect the new Gwanghwamun Square to become millions of places by millions of people who will come here. 21세기의 광장은 통일된 목적을 위해 존재하지 않는다. 시민들은 저마다의 이유로 광장에 존재하며 제각각의 장소를 구축한다. 서로가 서로의 배경이 되었다가, 때로는 큰 목소리를 위해 광장을 공유하기도 한다. 광장은 일상과 기념비가 혼성적으로 중첩되는 장소로서, 공원으로, 길로, 광장으로 그 모습을 바꾼다. 우리가 기대하는 광화문 광장은 수백만의 사람들이 만들어내는 수백만 개의 장소이다. Life in the city around the Gwanghwamun Square is diverse. A boundary between the city and the square disappears into a continuum of various urban activities. A square is no longer an enclosed space surrounded by roads and buildings. A square is an ever-evolving composite of a series of incomplete and continuing activities. A square is an open space. A good square embraces the city by engaging its neighboring public spaces. 광화문 광장을 둘러싼 도시의 일상은 다채롭다. 도시와 광장은 뚜렷한 경계를 갖기 보다는 도시적 행위의 다양성이 여러 밀도로 혼합되는 연속적 공간이다. 경계로 완결되지 않는 겹쳐진 행위의 연속성은 이 공간을 길과 건물에 둘러싸인 폐쇄공간이 아니라 주변의 공공공간들과 통합된 넓은 개방공간이 되어 도시의 구조물들을 품는다. Time makes changes in places. A new era requires a new place, but a trace of time makes a place richer by creating its own trajectory of time continuum. 600 hundred years of history at Gwanghwamun Square makes this place different from any other places in the city. This is the place that stands as the symbolic center of the city and its citizens. Everything that comes to this square is special. They speak to the thickness of its time that the place endured. 시간은 장소를 바꾼다. 새로운 시대는 새로운 장소를 요구하지만, 시간의 흔적으로 장소는 풍부해지며, 그로써 시간의 연속성을 만들어낸다. 600여년 동안의 이 장소의 역사는 도시의 다른 광장과 광화문 광장을 다르게 만드는 요인이다. 이 곳은 도시와 시민의 상징적인 중심이기 때문이다. 이 광장에 서는 것은 특별해야 한다. 그것은 지나온 시간의 특별함에 기대어 있다. Gwanghwamun Square was historically a government district. Yukjo (Six Government Ministries) Street was created as a device to maintain the class hierarchy of the old monarchy society. While Gwanghwamun Square today became an icon of the collective citizen movement, its meaning is still understood by its physical form. 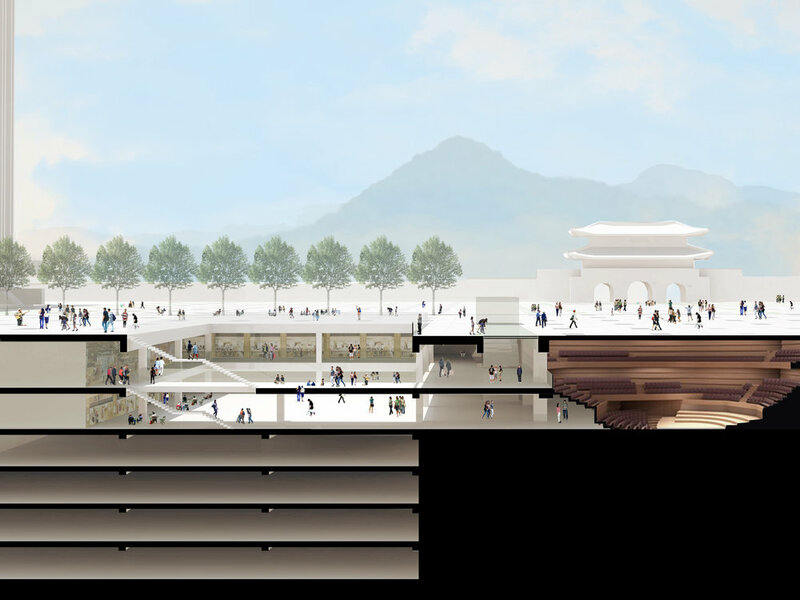 We expect the new Gwanghwamun Square to be a place where it is defined by the relationships between the people and the city around it, not its forms. 광화문 광장은 육조거리였다. 육조의 행랑은 계급질서의 의도적인 장치였으며 이 장소는 그렇게 소비되었다. 오늘의 광화문 광장은 집단화된 시민행동의 상징으로서 물리적 형태는 희석된 상태로 소비되고 있다. 우리가 기대하는 광화문 광장은 광장의 물리적 형태가 아니라 광장을 둘러싸고 있는 도시와 시민에 의해 규정되는, 관계가 만드는 장소이다. While a traditional square may have existed on a two-dimensional surface, diverse urban programs of today’s square require more than just a thin surface. It requires a thickness and has to be restructured that way. 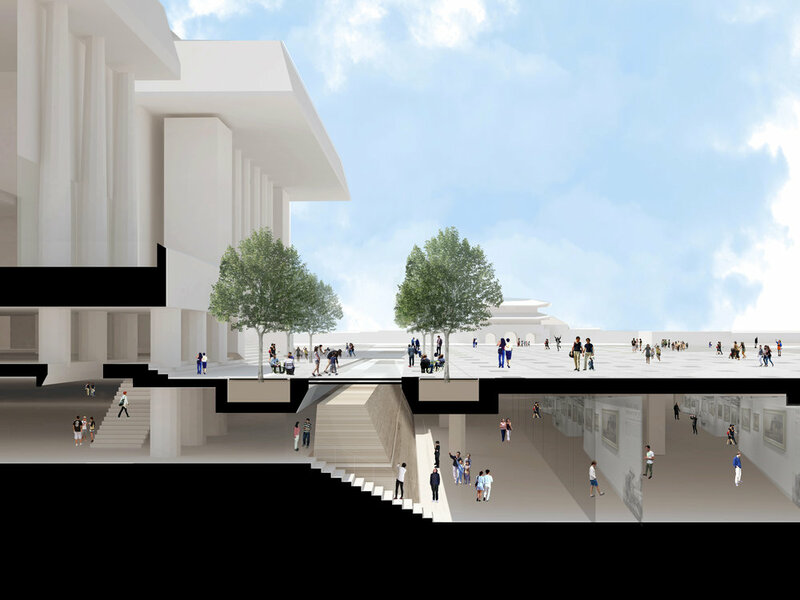 The fragmented underground programs that only serve the adjacent buildings have to be integrated into the square both above and below, and vertically and laterally. A square has to become a device that generates a diverse space, time and activity continuum. 광장은 본질적으로 표면으로 존재하는 2차원의 공간이다. 광장이 요구하는 도시의 행위들이 하나의 얇은 표면으로 충족되지 않는 시대에, 광장은 두꺼운 공간으로 재조직되어야 한다. 일대 지하의 공간은 각각의 건물과 도로에 부속되어 파편화되어 있다. 건물들이 광장의 요소가 되려면, 광장 표면의 아래와 위, 지면층과 지하부의 공간이 경계를 허물고 수직, 수평적으로 통합되어야 한다. 이는 공간, 시간, 행위의 다양성과 연속성을 만들어내는 장치가 된다. Daily city life takes place on a continuous surface of the city. It is important to recognize Gwanghwamun square as continuous part of that urban surface instead of an isolated island. We propose to mitigate the limitations of the current public spaces and incorporate its larger values to enrich the place, access, people and experience. 일상의 도시는 면으로 펼쳐져 있다. 광화문 광장은 섬이 아니라 그 연속면의 일부이다. 우리는 현재 광화문 일대 공공공간의 한계적 상황을 수정하고, 넓은 범위의 공공공간의 가치를 통합함으로써, 광화문 광장의 공간, 접근, 사람, 행위를 보다 풍부하게 만들고자 한다.